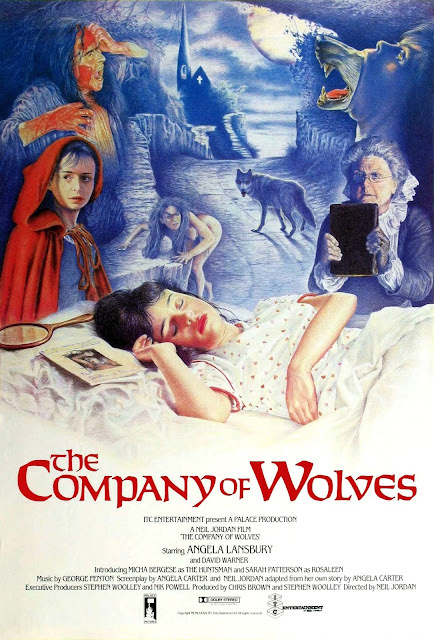 Neil Jordan's The Company Of Wolves (1984) is a surreal, wonderful, fantastical anthology film dealing with the exploration of a young girl's budding sexuality, a cautionary tale of the dangers of strange men, and a horrifying fairy tale with themes of female empowerment. The cast (including Angela Lansbury, David Warner, the young Red Riding Hood-clad lead Sarah Patterson, and an uncredited cameo by Terence Stamp) are all great, even when the dialogue is a bit silly at times. The visual f/x, including a couple of wolf transformations, are at times impressive and at times laughable, but all the while endearingly bizarre. I love the artifice of the sets, particularly the well-staged, fog-enshrouded shots in the woods. I've seen Wolves 3-4 times and always enjoy it. There really is nothing quite like it. "And if there's a beast in men, it meets its match in women too."